Winter is my favourite season for nerdery for three reasons. The sales are the obvious one; Stocking up on enough games to last another year (and probably only completing a third of them). The second is the festival of gaming skill that is the charity AGDQ speedruning marathon next month. The third reason is the Cacowards. An annual celebration run by the Doomworld modding community, as they nominate and vote on the greatest mods and levels released that year for Doom 1, 2 and their multitude of 90s-spawned cousins. 2017 has been a good year. Let’s check out the cream of the crop. We all know Doom is a timeless classic. Here’s some other must-have oldies on PC, many of them with similarly enduring modding scenes. 2017 has been a truly fine year, and the 24-year-old FPS shows no sign of weakening. Quite the opposite, with both the offline-focused GZDoom engine and its online variant Zandronum seeing multiple enhancements this year, establishing a foundation that we’ll see built on well into 2018. Cacoward-nomination-worthy stuff was being released right up until the awards were announced, to the point where a few easy picks (such as The Alfonzone, a 50-level pack inspired by an experimental MIDI compilation) flew under the radar. While it would be a huge waste of time to highlight everything in the Cacowards (just trawl through it yourself for that, and then check out past years for more), here’s three personal picks to get you started. Opening the Cacowards this year is something a little different, as shown in the video above. Lilith.pk3 is the closest thing I’ve seen to effective Doom creepypasta. 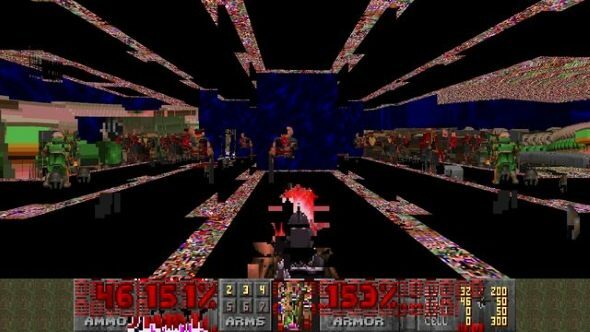 It’s a glitchcore nightmare – an intentional corruption that feels like playing a familiar game on a computer that is hideously wounded and bleeding out. It feels like your PC’s dying breath, and it’s honestly a little hard to stomach, which makes it one of my favourite tech-horror experiences of 2017. To give familiar levels a fresh feel, you might want to check out Final Doomer, which contains six different sets of weapons, each with a slick widescreen-friendly HUD. 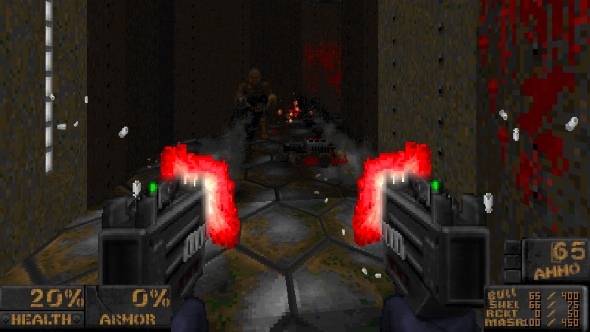 The first is just a better-animated reskin of the classic Doom arsenal with some new particle effects, but the remaining five are far more interesting. Play around with distinct new arsenals themed around Doom 2’s official two expansion campaigns (The Plutonia Experiment and Evilution), and three of the best player-made campaigns in recent years; Back To Saturn X, Ancient Aliens and the Japanese Community Project. They’re designed to be balanced roughly on par with classic Doom, but give a distinct new flavour to each campaign. Well worth trying out every pairing, or just mixing and matching. The last pick is the gift that keeps on giving, literally. Oblige is a procedural level generator for Doom, and an incredibly powerful one at that. Tell it how you want your campaign structured, how many enemies, how much ammo, what environment types you want and let it do its thing. In a couple minutes, you’ll have a complete new set of levels, fully named and with a procedurally generated title screen, too. The quality of the maps of course isn’t up to professional level, but Oblige’s output easily eclipses most beginners and even a few experienced mappers, and are certainly more detailed than the vanilla Doom & Doom 2 environments. Sometimes, it’s hard to believe it’s machine-made. For extra spice, try pairing this with Final Doomer, or any of the many monster-replacement mods available and you’ll never get bored. You’ll of course need a modern Doom engine (most likely GZDoom) to run all of these, and Doom 2 itself, but there you go: The death and infinite rebirth of Doom. So, what are your picks of the year? Sound off in the comments below, and keep on fragging.